By the late-1950s, the U.S. Auto Industry was on a high. Styling was reaching a new apex where cars were no longer were just cars, but works of art. Chrome wasn’t just something that was added to a car but it was showered onto cars with no restraint. Ford was also caught in the moment. There was a rising star at Ford who’s name was Robert McNamara. In November 1960 he became the President of Ford Motor Company, but a few weeks later he would make history when he became JFK’s Secretary of Defense. It was this job that McNamara will forever be remember for, he would step down from the position in early-1968 during the height of the infamous Vietnam War which he boar some of the blame for escalating. Most people are unaware that McNamara’s legacy at Ford lives on today. McNamara was one of the first automobile executives who studied trends and released cars to fuel these trends. McNamara understood what buyers wanted before they did. For instance, the 1961 Lincoln Continental, 1960 Ford Falcon, and 1958 Ford Thunderbird were all revolutionary and very successful cars. All made it to production due to McNamara’s insistence and his great ability at predicting future trends. When the 2-seater 1955 Ford Thunderbird became an overnight success, Ford continued the streak through the 1957 model year. Sales steady increased to 21,380 units for 1957. For McNamara this wasn’t enough, after careful study he realized that adding a backseat to the Thunderbird would broaden its appeal thereby substantially increase sales. This move would forever make “McNamara” a dirty word among 2-seater Thunderbird purists, but it caused sales to nearly double overnight. Production for the 1958 Thunderbird (T-Bird) was 37,892 units. The 1958 T-Bird had beautiful new squarish styling which was a foreshadow of the cars to come in the 1960s. Yet it still had the rear fins and other styling cues that customers wanted in the late-1950s but they were understated compared to many other cars of this era. The 1958 T-Bird was spared no luxury or convenience option, so many of these beautiful cars were loaded with options. The T-Bird was more luxurious than the other Fords of this era. The T-Bird in reality would have been a better fit in the Lincoln car lineup. However that would have detracted from the master plan of bringing customers into Ford dealerships which the T-Bird certainly did. The T-Bird was Ford’s flagship car. It was a car of distinction and of class. Those that owned one couldn’t imagine owning another car, those that didn’t, wanted to own one. Though a large majority of 1958 T-Birds were hardtop coupes, there was a convertible model also available. The T-Bird was also sporty with it being only available with 2-doors and a hood scoop which is something that many muscle cars would later have. There was decent muscle under the T-Bird’s hood, it came standard with a 300 horsepower 352 cubic inch V8 which had a 4-barrel carburetor and was standard with dual exhausts. Two transmissions were available, a column shift 3-speed manual which could be equipped with overdrive as an option and a column shift 3-speed automatic transmission. 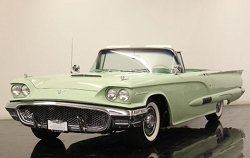 Unlike the previous year T-Bird, the 1958 had gained a lot of weight, the hardtop coupe weighed in at a hefty 3,708 lbs and the convertible was 3,903 lbs which was 1,000 lbs heavier than the 1957 T-Bird. The 1958 T-Bird had state-of-the-art unibody construction and had a sophisticated suspension which had coil springs in all four corners. The T-Bird was assembled in the brand new Wixom, Michigan assembly plant alongside Lincoln models. 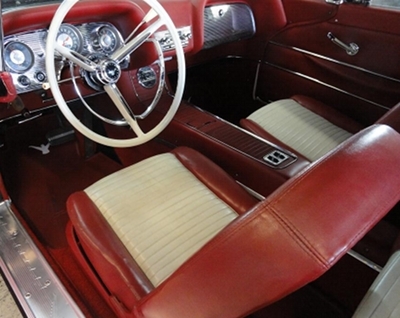 The interior of the 1958 T-Bird was far ahead of its time. Most cars of its era had flat front and rear bench seats. Not the T-Bird, it had comfortable front bucket seats and stylish rear seats. Both were contoured to provide occupants the ultimate in comfort and gave the T-Bird’s interior a futuristic look. The overall look of the interior was that of a sporty luxury car. The stylish dash and center console would have pleased even the most fussy socialite back in the day. The dashboard littered with round gauges was well ahead of it time. Additionally even the power windows switches were located in the center console which is something many sports cars would later copy. The 1959 T-Bird would be a virtual carryover from 1958, only the front grille and a few very slight ornamentation changes were made. It proved to be a smart move, since sales went through the roof, 67,456 T-Birds were produced for 1959. The 352 V8 and all transmission choices carried over from 1958. The big news for 1959 was the addition of Lincoln’s 430 cubic inch V8 to the T-Bird’s option list. 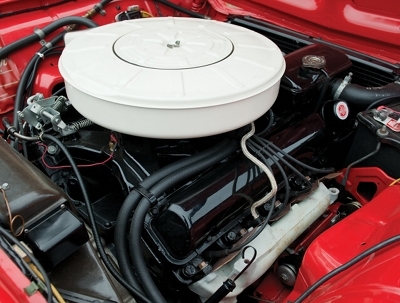 The 430 V8 turned the heavy T-Bird into a quick accelerating car for its day. The 430 V8 was only available with the 3-speed automatic transmission and dual exhausts. It was rated at 350 horsepower which back in 1959 was a lot of horsepower. Ford not wanting to mess with a good thing left the Thunderbird alone for 1960, everything from the previous year including transmission choices, engine choices, and overall design carried over. The only changes were a new front grille and very slight ornamentation changes. Just like 1958 and 1959, a convertible option was available. The big change for 1960 was the addition of a retractable sun roof option. A sun roof was a new idea back in 1960, today it’s a very popular option. 1960 would prove to be a banner year for T-Bird production, 92,843 units were produced. This production figure would not be surpassed until the T-Bird’s 1977 model year. 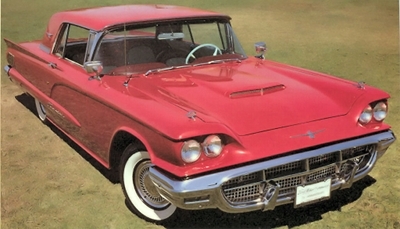 The big advantage of the 1958-1960 T-Bird was that it had no competitors. It had created and was the only occupant in the personal luxury car segment. The T-Bird with a backseat wouldn’t get a competitor until 1962 when Pontiac released the 2-door Grand Prix. Ironically the person luxury car segment that the T-Bird had created became one of the most popular car segments in the 1970s. For 1961, Ford would go with a space-age sleek aerodynamic design for the T-Bird. This solidified the 1958-1960 T-Bird’s nickname of being the “Square Bird” because it’s squarish shape would forever define this second generation T-Bird. Though Ford lost it’s 2-seater in 1958, McNamara did make a wise move with the addition of a backseat to the Thunderbird. The 1958-1960 Thunderbird is the perfect time piece of its era, it offered true luxury, beautiful styling, and a lot of class to middle America. It’s a true American success story.